The entire Fact Sheet FS-163-97 can be downloaded and viewed with Adobe Acrobat Reader. If you do not already have Acrobat Reader, you may download Adobe Acrobat Reader from this site. Coal is largely composed of organic matter, but it is the inorganic matter in coal—minerals and trace elements— that have been cited as possible causes of health, environmental, and technological problems associated with the use of coal. Some trace elements in coal are naturally radioactive. These radioactive elements include uranium (U), thorium (Th), and their numerous decay products, including radium (Ra) and radon (Rn). Although these elements are less chemically toxic than other coal constituents such as arsenic, selenium, or mercury, questions have been raised concerning possible risk from radiation. In order to accurately address these questions and to predict the mobility of radioactive elements during the coal fuel-cycle, it is important to determine the concentration, distribution, and form of radioactive elements in coal and fly ash. Assessment of the radiation exposure from coal burning is critically dependent on the concentration of radioactive elements in coal and in the fly ash that remains after combustion. Data for uranium and thorium content in coal is available from the U.S. Geological Survey (USGS), which maintains the largest database of infor-mation on the chemical composition of U.S. coal. This database is searchable on the World Wide Web at: http://energy.er.usgs.gov/products/databases/ CoalQual/intro.htm. Figure 1 displays the frequency distribution of uranium concentration for approximately 2,000 coal samples from the Western United States and approximately 300 coals from the Illinois Basin. In the majority of samples, concentrations of uranium fall in the range from slightly below 1 to 4 parts per million (ppm). Similar uranium concentrations are found in a variety of common rocks and soils, as indicated in figure 2. Coals with more than 20 ppm uranium are rare in the United States. Thorium concentrations in coal fall within a similar 1–4 ppm range, compared to an average crustal abundance of approximately 10 ppm. Coals with more than 20 ppm thorium are extremely rare. During coal combustion most of the uranium, thorium, and their decay products are released from the original coal matrix and are distributed between the gas phase and solid combustion products. Figure 1. Distribution of uranium concentration in coal from two areas of the United States. The partitioning between gas and solid is controlled by the volatility and chemistry of the individual elements. Virtually 100 percent of the radon gas present in feed coal is transferred to the gas phase and is lost in stack emissions. In con-trast, less volatile elements such as thorium, uranium, and the majority of their decay products are almost entirely retained in the solid combustion wastes. Modern power plants can recover greater than 99.5 percent of the solid combustion wastes. The average ash yield of coal burned in the United States is approximately 10 weight percent. Therefore, the concentration of most radioactive elements in solid combustion wastes will be approximately 10 times the concentration in the original coal. 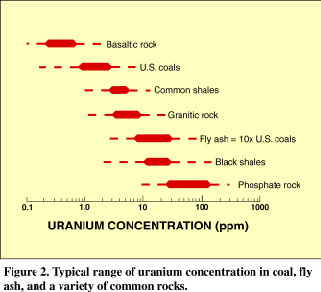 Figure 2 illustrates that the uranium concentration of most fly ash (10 to 30 ppm) is still in the range found in some granitic rocks, phosphate rocks, and shales. For example, the Chattanooga Shale that occurs in a large portion of the Southeastern United States contains between 10 and 85 ppm U. The USGS has a current research project to investigate the distribution and modes of occurrence (chemical form) of trace elements in coal and coal combustion products. The approach typically involves (1) ultra sensitive chemical or radiometric analyses of particles separated on the basis of size, density, mineral or magnetic properties, (2) analysis of chemical extracts that selectively attack certain components of coal or fly ash, (3) direct observation and microbeam analysis of very small areas or grains, and (4) radiographic techniques that identify the location and abundance of radioactive elements. Most thorium in coal is contained in common phosphate minerals such as monazite or apatite. In contrast, uranium is found in both the mineral and organic fractions of coal. Some uranium may be added slowly over geologic time because organic matter can extract dissolved uranium from ground water. In fly ash, the uranium is more concentrated in the finer sized particles. If during coal combustion some uranium is concentrated on ash surfaces as a condensate, then this surface-bound uranium is potentially more susceptible to leaching. However, no obvious evidence of surface enrichment of uranium has been found in the hundreds of fly ash particles examined by USGS researchers. The above observation is based on the use of fission-track radiography, a sophisticated technique for observing the distribution of uranium in particles as small as 0.001 centimeter in diameter. 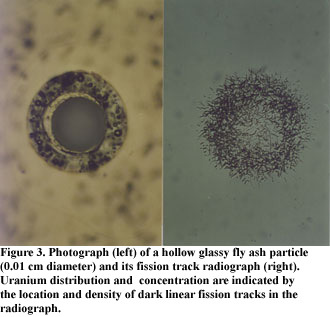 Figure 3 includes a photograph of a hollow glassy sphere of fly ash and its corresponding fission track image. The diameter of this relatively large glassy sphere is approximately 0.01 cm. The distribution and concentration of uranium are indicated by fission tracks, which appear as dark linear features in the radiograph. Additional images produced by USGS researchers from a variety of fly ash particles confirm the preferential location of uranium within the glassy component of fly ash particles. Radioactive elements from coal and fly ash may come in contact with the general public when they are dispersed in air and water or are included in commercial products that contain fly ash. The radiation hazard from airborne emissions of coal-fired power plants was evaluated in a series of studies conducted from 1975–1985. These studies concluded that the maximum radiation dose to an individual living within 1 km of a modern power plant is equivalent to a minor, perhaps 1 to 5 percent, increase above the radiation from the natural environment. For the average citizen, the radiation dose from coal burning is considerably less. 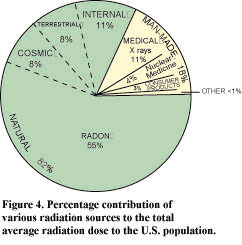 Components of the radiation environment that impact the U.S. population are illustrated in figure 4. Natural sources account for the majority (82 percent) of radiation. Man-made sources of radiation are dominated by medical X-rays (11 percent). On this plot, the average population dose attributed to coal burning is included under the consumer products category and is much less than 1 percent of the total dose. Fly ash is commonly used as an additive to concrete building products, but the radioactivity of typical fly ash is not significantly different from that of more conventional concrete additives or other build-ing materials such as granite or red brick. One extreme calculation that assumed high proportions of fly-ash-rich concrete in a residence suggested a dose enhancement, compared to normal concrete, of 3 percent of the natural environmental radiation. Another consideration is that low-density, fly-ash-rich concrete products may be a source of radon gas. Direct measurement of this contribution to indoor radon is complicated by the much larger contribution from underlying soil and rock (see fig. 4). The emanation of radon gas from fly ash is less than from natural soil of similar uranium content. Present calculations indicate that concrete building products of all types contribute less than 10 percent of the total indoor radon. Approximately three-fourths of the annual production of fly ash is destined for disposal in engineered surface impoundments and landfills, or in abandoned mines and quarries. The primary environmental concern associated with these disposal sites is the potential for groundwater contamination. Standardized tests of the leachability of toxic trace elements such as arsenic, selenium, lead, and mercury from fly ash show that the amounts dissolved are sufficiently low to justify regulatory classification of fly ash as nonhazardous solid waste. Maximum allowable concentrations under these standardized tests are 100 times drinking water standards, but these concentration limits are rarely approached in leachates of fly ash. The leachability of radioactive elements from fly ash has relevance in view of the U.S. Environmental Protection Agency (USEPA) drinking water standard for dissolved radium (5 picocuries per liter) and the proposed addition of drinking water standards for uranium and radon by the year 2000. Previous studies of radioelement mobility in the enviroment, and in particular, in the vicinity of uranium mines and mills, provide a basis for predicting which chemical conditions are likely to influence leachability of uranium, barium (a chemical analog for radium), and thorium from fly ash. For example, leachability of radioactive elements is critically influenced by the pH that results from reaction of water with fly ash. Extremes of either acidity (pH<4) or alkalinity (pH>8) can enhance solubility of radioactive elements. Acidic solutions attack a variety of mineral phases that are found in fly ash. However, neutralization of acid solutions by subsequent reaction with natural rock or soil promotes precipitation or sorption of many dissolved elements including uranium, thorium, and many of their decay products. Highly alkaline solutions promote dissolution of the glassy components of fly ash that are an identified host of uranium; this can, in particular, increase uranium solubility as uranium-carbonate species. Fortunately, most leachates of fly ash are rich in dissolved sulfate, and this minimizes the solubility of barium (and radium), which form highly insoluble sulfates. Direct measurements of dissolved uranium and radium in water that has contacted fly ash are limited to a small number of laboratory leaching studies, including some by USGS researchers, and sparse data for natural water near some ash disposal sites. These preliminary results indicate that concentrations are typically below the current drinking water standard for radium (5 picocuries per liter) or the initially proposed drinking water standard for uranium of 20 parts per billion (ppb). Radioactive elements in coal and fly ash should not be sources of alarm. The vast majority of coal and the majority of fly ash are not significantly enriched in radioactive elements, or in associated radioactivity, compared to common soils or rocks. This observation provides a useful geologic perspective for addressing societal concerns regarding possible radiation and radon hazard. Previous studies of dissolved radioelements in the environment, and existing knowledge of the chemical properties of uranium and radium can be used to predict the most important chemical controls, such as pH, on solubility of uranium and radium when fly ash interacts with water. Limited measurements of dissolved uranium and radium in water leachates of fly ash and in natural water from some ash disposal sites indicate that dissolved concentrations of these radioactive elements are below levels of human health concern. Tadmore, J., 1986, Radioactivity from coal-fired power plants: A review: Journal of Environmental Radioactivity, v. 4, p. 177–204. Cothern, C.R., and Smith, J.E., Jr., 1987, Environmental Radon: New York, Plenum Press, 363 p.
Ionizing radiation exposure of the population of the United States, 1987: Bethesda, Md., National Council on Radiation Protection and Measurements, Report 93, 87 p.
Swaine, D.J., 1990, Trace Elements in Coal: London, Butterworths, 278 p.
Swaine, D.J., and Goodarzi, F., 1997, Environmental Aspects of Trace Elements in Coal: Dordrecht, Kluwer Academic Publishers, 312 p.